On December 3, 2015 the Pentagon made history by announcing that all positions in the U.S. military—including combat roles—would open to women. This Friday, I’ll join Juliet Beyler, Principal Director, Force Resiliency in the Office of the Under Secretary of Defense for Personnel and Readiness at the Department of Defense, and Agnes Gereben Schaefer, Senior Political Scientist at the RAND Corporation, to discuss the complexities of the Pentagon’s decision, the challenges of integrating women into today’s armed forces, and the potential military, diplomacy, and national security benefits to be reaped. The storied reporter Kimberly Dozier will moderate. An integral part of the dialogue about women in the armed forces is the fact that women have served on the frontlines for years, even with the Pentagon’s official ban on women in combat in place. Women have served courageously as combat pilots, field artillery officers, and special operations civil affairs officers, and in intelligence gathering and even the ultra-secretive Delta Force. The fighting force of the U.S. military has changed significantly over time, making last year’s announcement less of a groundbreaking policy shift than a recognition of the on-the-ground reality of 21st century warfare. In discussing the challenges of integrating women into today’s armed forces, there are important lessons to be learned from the experiences—and successes and challenges—of women who have already served. In Iraq and Afghanistan, an estimated 300,000 women in uniform have served, and female service members have earned over 10,000 combat action badges and Bronze Stars, according to analysis from the organization Women in International Security. 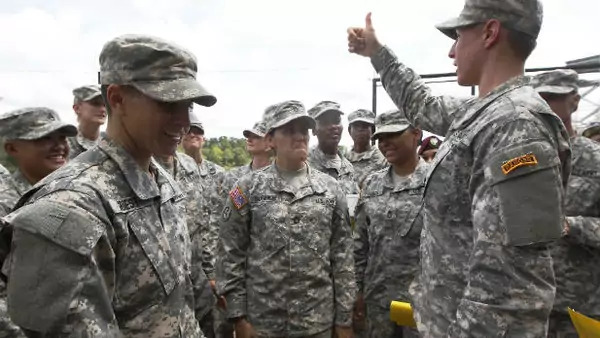 In recent years, women have made incredible advances in the military’s ranks and received its highest accolades, including receiving the nation’s third-highest decoration for valor, the Silver Star, for service in Iraq and Afghanistan. My book Ashley’s War: The Untold Story of a Team of Women Soldiers on the Special Ops Battlefield, shared the story of one team of women who have served our country with honor on the special operations battlefield. Ashley White and her band of sisters served alongside the highly trained soldiers of the 75th Ranger Regiment on what the Army termed a Cultural Support Team. Cultural Support Teams in Afghanistan added critical value to U.S. operations—female service members were able to move in spaces that male soldiers could not, allowing them to gather battle-critical information and knowledge from Afghan women and children that would not have otherwise been accessible. The newly released paperback edition of the book also looks toward the future of women in the armed forces—it features a Q and A with Lieutenant Shaye Haver, who, along with Captain Kristen Griest, became one of the first two women to graduate from the prestigious Army Ranger School in August of 2015. This marked the first time that Army Ranger School opened to women. The women graduates slogged through a 62-day leadership school that includes a sub-forty-minute five-mile run, a twelve-mile march in three hours, and an air assault in Florida’s swamps. And we can expect more change to come to the makeup of our fighting forces. Just last week, the Army announced the commissioning of twenty-two women as infantry and armor officers for the first time ever. If these women successfully complete specialty schools and meet certain physical requirements, they may access roles in the U.S. Armed Forces that never before have been open to women. Follow our discussion on Friday about the future of America’s armed forces and the Pentagon’s decision to open all combat positions to women by tuning in to the livestream of the meeting at http://www.cfr.org/events.